The State-Owned Enterprises (SOEs) are top instruments for service delivery. As they are within the control of the state and not subject to global market uncertainties, there can be no excuse for poor performance. Faith needs to be restored in the SOEs, especially those with significant service delivery roles and/or the largest component of government guarantees. This refers to Eskom, Sanral, SAA, TCTA, the Road Accident Fund, Transnet, Prasa and PetroSA. Eskom is by far the most urgent, posing concerns not just for energy services but also for economic stability. In 2013, I joined Telkom as Head of Strategy to support Sipho Maseko and Jabu Mabuza in crafting and charting the turnaround. What can we learn from Telkom’s recent turnaround experience? We now have proof that it is possible to turn around a large failing entity in a short space of time. At Telkom, we progressed through stages of a soft landing, to stabilization to growth in three short years. Our strategy at Telkom focused on achieving concrete early improvements that laid the ground for longer term growth. This resulted in successive annual improvement over the course of more than five years. Effective governance is the most important starting point. It is simply impossible to maintain, turn around or sustainably drive growth without it. Leadership instability is the top challenge faced by many SOEs, and this was certainly the case at Telkom. After Sizwe Nxasana’s departure from Telkom in 2005, the average CEO tenure was 1.8 years, until Sipho Maseko took the reins in April 2013. After Dikgang Moseneke’s 7 year tenure as board chairman ended in 2001, the position was held for an average of 2 years until Mabuza joined in 2012. Now let’s look at Eskom. After Thulani Gcabashe left in 2007, Eskom had 6 CEOs, plus a further 2 acting CEOs, making the average tenure 1.5 years if we stop counting at Brian Molefe. And Molefe is counted as one CEO, although he was appointed twice. Reuel Khoza was board chairman for 8 years until 2005. Since then, the average tenure is 2 years. Continuity is at least one simple reason for the success in Telkom’s turnaround – both Mabuza and Maseko have now been in place for about 5 years. Installing non-conflicted leadership with proven capability is a second related SOE challenge. In 2013, my decision to join a very troubled Telkom, against all rational advice not to do so, was based on the quality of the new Board and CEO. I see the same qualities in this new Eskom leadership team. King III principles and the PFMA are well understood, but not necessarily implemented even when serious gaps are identified. In the case of Eskom, there were at least four red flags raised since 2015. The most formal alerts are found in the board appointed forensic investigation into Eskom’s operations prepared by Denton’s in 2015, the Public Protector’s Report on State Capture in 2016, Eskom’s auditor notes to its Annual Financial Statements released in 2017 and alert to the Auditor General of accounting irregularities, which in turn were reflected in the Auditor General’s report in 2017. At a minimum, these show significant increases in irregular expenditure amounting to about R4 billion in 2016/17, irregularities in relation to the retirement payment for Molefe, allegations against the interim CEO Koko, allegations in respect of Tegeta, plus a myriad of findings in the Denton’s report. And yet, the board audit and risk committee found controls to be adequate in all respects for its 2016/17 Annual Financial Statements. In response to the State of Capture report, the annual report asserts that good value was created by the Tegeta transaction. There are no formal dissenting voices in the annual report, although there were 8 resignations in 2016/17, in a board that previously was comprised of 11 independent members. All the appropriate rules and processes were in place, but not applied to their spirit. At Telkom, Maseko prioritised procurement, by elevating it to an Exco function, hiring Ian Russell who had top corporate procurement experience. Russell then reformed procurement processes to make them more transparent. The approach taken by Telkom’s new procurement chief was already long in place at Eskom, at least back to Brian Dames’ tenure as CEO between 2010-2013. This speaks volumes about the character of leadership – whether conflicted, lacking sufficient capability to know different or simply too weak to speak. Telkom had strained relationships with all its stakeholders, including the board, the staff, government, the regulator and customers. Where credibility is lost, it is crucial to be brutally honest about why, and deliver noticeable concrete results. At Telkom, some of the first results were the settling of competition commission case, and significant inroads into stabilising the finances initially involving an impairment and a 3% reduction in non-labour opex within 8 months. A regular change of guard impacts on staff behaviour and performance. Staff were quite probably going to say one thing, do another, and wait for Maseko to pass through. As new management, you will never know the ins and outs as well as they do, and so they can be your greatest friend or foe. Our starting point is a belief in human nature and in leadership: that most people would rather do a good job, have positive feedback and be proud of their employer, than not. When there is poor delivery across the board, it is more likely the fault of leadership in making clear what is expected, acting as an enabler, and instilling this into meaningful performance incentives. The executive suite must appreciate that staff at the coal face deliver the results. The relationship between Telkom and Government evolved to become enabling, and Telkom leadership was able to run the company without interference. Yet, public policy indecision does still have to be resolved. Had there not been significant Government shareholding in 2013, it is very likely that Telkom would have been asset stripped when the market capitalisation sat at a fraction of its underlying value. Yet, Government is still a major shareholder but has yet to fully leverage Telkom’s extensive fibre network for broadband roll out. Eskom is not the only culprit in the current crossroads, and nor are allegedly greedy fingers. They played into years of indecision and uncertainty. Eskom could not build up sufficient reserves to cover the costs of maintenance, replacement or new capacity. The real electricity price fell from 1983 to 2002 and the price in 2008 matched that of 1995. 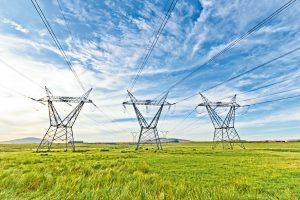 Limited reserves were partly caused by indecision in respect of who would build new capacity –whether it would be Eskom or other private investors. This was the context for the new build programme. The price subsequently doubled in real terms between 2008 – 2017. The electricity price is not out of step globally, but the price path has created understandable consternation for users. 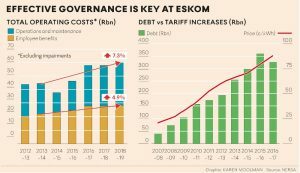 To stabilise, Eskom will have to convince creditors that there is commitment to good governance and a pathway to sustainability. Eskom’s new board is the most important first milestone. Next steps will be to urgently appoint a permanent CEO and round out the Exco in a way that demonstrates a new beginning. Eskom’s communication needs to be open, humble and give stakeholders a true reflection of the state of affairs whether good or bad. Transparency in procurement, along the lines of Gauteng’s open model, would give confidence that investment is not being drained out illicitly. A pathway to building reserves whether through price recovery, debt or equity is needed. Government as the shareholder needs to set a mandate that will achieve NDP goals and give space to the board and management to deliver. Clear, credible and non-conflicted policy guidance is required. The good news is that it is possible to achieve rapid and sustainable turnarounds in these large SOEs.